My daughter goes to half-day kindergarten this year. While she does lunch after we come back home, I pack her a snack for the morning which is usually cut up fruit or vegetables. Next year inshaAllah she will be going full-day to grade 1 and I’m sure I will join the frantic mommy quest of “healthy-filling-tasty-school-lunches-that-don’t-come-back-untouched”. Packing the snack this year is good practice for the challenge of school lunch next year and talking about desi lunch boxes. Yesterday we had an unusually busy day and I knew we wouldn’t be able to have lunch till later. So I packed my daughter a paratha (fried bread) for snack to sustain her for longer. My daughter was most amused that she was taking an “Urdu” lunch to school and excited to show it to her friends. Food has always been an important part of cultural identity and I found it interesting how young children are exposed to diversity through something as simple as a lunch box. 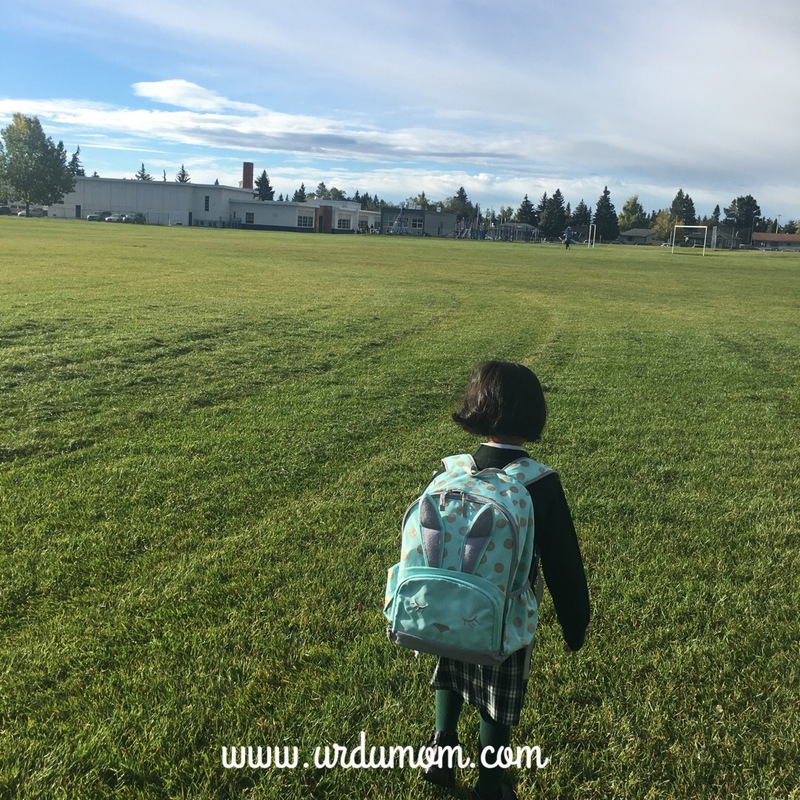 Her school in Canada is fairly multicultural with families from all around the world. I did know that a boy in her class was from Pakistan because I had chatted with his mom at drop off. My daughter though was still trying to figure out if he knew Urdu and brought interesting snippets everyday as she tried to solve this big mystery: “mama, I think I heard B call his mother Ammie, that means he knows Urdu”, “I asked him in class today in angraizi and he said yes” etc. The mystery was conclusively solved however by B’s lunch. My daughter told me one day as she sat in the car: “mama, B is Urdu for sure”. I asked her what made her so sure. She replied: “He brought Daal Chawal to school!”. B’s mother like me relied on a homemade desi favourite to make sure her boy ate at school. We aren’t the only ones and join the ranks of millions of desi moms sending desi lunch boxes proudly to school. I think I will stop short of packing achar (pickles) but all healthy desi food without strong smells and greasy residue is game. I wonder how my daughter will feel about this as she grows older. Even though I went to school in Pakistan, I always found my soggy shami kebab sandwich dripping with ketchup extremely unappealing compared to my friend’s neat cucumber sandwiches which were cut in triangles and had a sprinkle of pepper on the slice of processed (imported) cheese. In retrospect I know my lunch was more healthy but it definitely didn’t have the coolness factor. I hope I remember the insights of my eight-year-old self to keep my daughter’s lunch both appealing and healthy. Have you packed your kids desi lunch boxes? Do you remember your school lunches? I LOVED reading it all through! Occasionally, when my kids are tuned to omelette paratha roll,i send that in their lunch. But lately they are not very fond of it. I used to take omelette sandwich, kebab sandwich at times, perhaps jam sandwich and cheese sandwich too. May be the sandwich variety was because my mom had a bunch of us to handle at the same time! My best friend, however, almost ALWAYS had paratha and fried egg in her lunch box, sometimes gooey when the yolk was punctured but it still looked yummy. Thanks for the feedback 🙂 Yes, now I have more empathy for moms who made multiple lunches! Loved your lunch memories, it’s amazing how much detail we retain from the past! Thanks for dropping by and stay in touch. My kids are both in school for the first time this year. I definitely need to add more desi in their lunch boxes. Thanks for the ideas. Very nice article. This is the biggest issue in my house every morning. My son wants to take something that can be packed in foil or sandwich bag as he doesn’t want to take lunch box (teens issues) but tired of eating sandwiches and rolls. So i m in dilemma what to put in a sandwich bag that is not a sandwich ? only sometimes tortillas or buns give me break for a couple of days and then the problem arises again ? ?